With fiery Portuguese gusto, owner of Ocean Odyssey Evelyn Pepler is a force to be reckoned with. Adding to her passion of the environment she has recently been certified as a Registered Nature Site Guide for Marine and Coastal (Whale Watching). Steff was introduced early in life to our local marine environment by his father and has had a love affair with the ocean ever since. 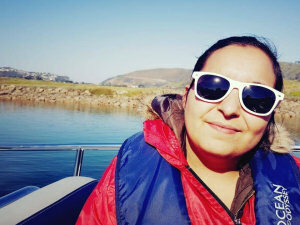 Steff is a qualified skipper (A1 (1) and A11 Category C) as well as a certified Registered Nature Site Guide for Marine and Coastal (Whale Watching). He has been navigating the Knysna Heads and the adjacent Indian Ocean for over 20 years. Lucy’s Career started in the financial sector working for some top corporate banks in South Africa. She has now settled in our little piece of paradise and has since become a certified Registered Nature Site Guide for Marine and Coastal (Whale Watching). Jorika takes the role of PA, Reservations Manager & In-House Designer to a whole new level and her proficiency acts like the glue that brings the company seamlessly together. Leandre’s friendly smile will be the first thing you see when you check-in for your tour. This soft spoken young lady is dynamite in a small package handling our retail and reservations sector, welcoming of guests and general office duties. Teresa is new to the team and to Knysna. After spending many years in sales and marketing in Durban and Johannesburg she decided to relocate to Knysna. Teresa will be assisting the marketing, admin and reservations departments. Johannes is an experienced Skipper (Category C) and a registered Nature Site Guide for Marine and Coastal (Whale Watching). 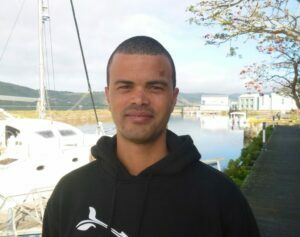 Johannes was born and bred in Knysna growing up with a passion for the ocean and marine life. Muzi is the life of the party and there is never a dull moment around him. His smile and laugh is super contagious! 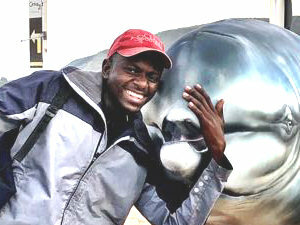 Muzi is new to our crew but not a stranger to the sea! Oh yeah! Eric grew up in Knysna. After he matriculated he studied at Boston City campus. He was also part of the local sea cadets for 5 years. He is a friendly soft spoken guy and we are happy to have him as part of our team. Eric has been selected to train as a skipper and is super excited to take the helm!